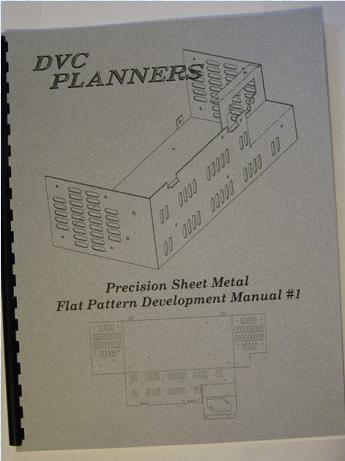 This Precision Sheet Metal Layout Manual will help the beginning shop employee or student to understand how to use basic math, trigonometry and geometry in the development of flat patterns. It is designed to be used with a scientific calculator encouraging more productive and efficient layout procedures. The manual instructs how to do flat pattern development of 90 degree, obtuse and acute bend angles. It teaches how to use bend deduction or bend allowance formulas, bend reliefs, corner notching, joggles, hems and much more. It is written in a workbook style format that starts with basic concepts and builds up to more complicated problems. These illustrations are samples from the manual. Workbook measures 8-1/2" x 11" and contains 55 pages.